Marcus Tullius Cicero was a Roman philosopher, statesman, lawyer, political theorist, and Roman constitutionalist. He came from a wealthy municipal family of the equestrian order, and is widely considered one of Rome's greatest orators and prose stylists. He introduced the Romans to the chief schools of Greek philosophy and created a Latin philosophical vocabulary (with neologisms such as humanitas, qualitas, quantitas, and essentia) distinguishing himself as a linguist, translator, and philosopher. 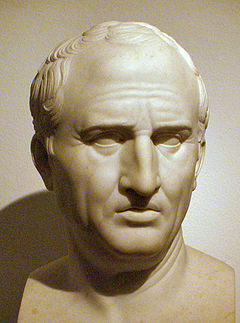 An impressive orator and successful lawyer, Cicero thought that his political career was his most important achievement. Today, he is appreciated primarily for his humanism and philosophical and political writings. His voluminous correspondence, much of it addressed to his friend Atticus, has been especially influential, introducing the art of refined letter writing to European culture. Cornelius Nepos, the 1st-century BC biographer of Atticus, remarked that Cicero's letters contained such a wealth of detail "concerning the inclinations of leading men, the faults of the generals, and the revolutions in the government" that their reader had little need for a history of the period. Cicero's speeches and letters remain some of the most important primary sources that survive on the last days of the Roman Republic.